Among the many boulders along the Salt River at Phoenix, Arizona, USA. Oct. 2009. 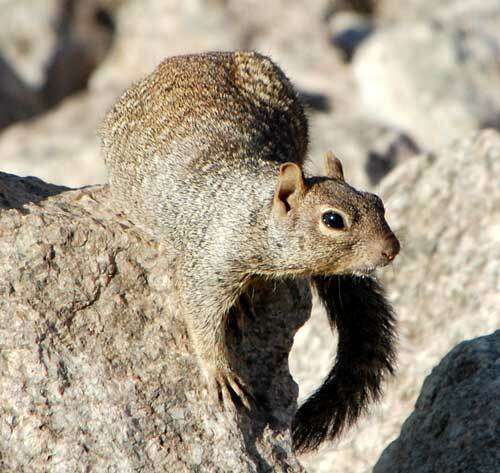 These large ground squirrels are common in the Sonoran Desert on rocky slopes and sometimes along desert washes. They also occur at higher elevations where there is open rocky habitat. They make a loud, high-pitched, barking sound if danger is nearby - often times the hiker will hear this and be sure that there is a predator nearby - such as a coyote or soaring hawk - unless of course the squirrel is instead alarmed by a noisy hiker. Color can range from brown and gray to much darker, almost black. At Peña Blanca, Sta. Cruz Co., a rock sqirrel was seen filling its cheeks with fruit and seeds of graythorn, a densly thorny shrub.